There are good reasons to be able to play a slow sautille and a super-fast spiccato. Here are some pointers on how to learn. Has anyone ever explained how sautille really happens, in this kind of detail? I don’t think so, and I believe this video really shows how the bow bounces like nothing I’ve ever seen or heard. Can you play a real spiccato stroke (not sautille) at about 140 on the metronome? If you can, you’ll have at least two options for bowstrokes in fast and complicated, off-the-string passages. A simply nice bounce of the bow off the string often does not convey the energy and excitement the music demands. Here’s how to turn up the electricity of your spiccato. The San Francisco Bay Area’s newest concert hall, the 500-seat Performing Arts Center at Menlo-Atherton, was inaugurated on Sunday afternoon in front of a capacity audience by David, Wu Han, and clarinetist Anthony McGill. Presented by Music@Menlo, the event celebrated the creation of a state-of-the art venue for chamber music in Silicon Valley, and introduced Music@Menlo audiences and new listeners to an additional location for selected festival concerts. 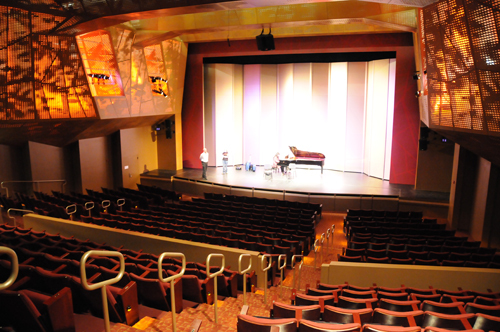 The Performing Arts Center at Menlo-Atherton has been on our radar for some time. Having been invited during the planning stages to provide input on design and acoustics, and having witnessed the various stages of construction in several hard-hat tours, Music@Menlo seemed the fitting choice to present the hall’s first ticketed, non-school event. As Wu Han mentioned when she addressed the audience, Anthony McGill performed in the very first Music@Menlo concert, on a single day festival that we held in 2002 to introduce the concept. Her comment that it was only natural that he should be a part of this hall’s maiden voyage, especially given his recent international exposure as the inaugural clarinetist for President Obama, drew cheers from the audience and a wide, proud grin from Anthony, who was sitting on stage with us. Our program included the clarinet trios by Beethoven and Brahms, plus the Beethoven g minor sonata for piano and cello. Anthony amazed with his usual incredible sound and technique, and the kind of passion that has endeared him to Music@Menlo audiences for years. A special note of interest for this program: none of the works, including the encore by Bruch, had ever been programmed for the main stage at the festival, and it was the first occasion on which Anthony, Wu Han and I have played together as a trio. So it was truly a concert of firsts in many ways. 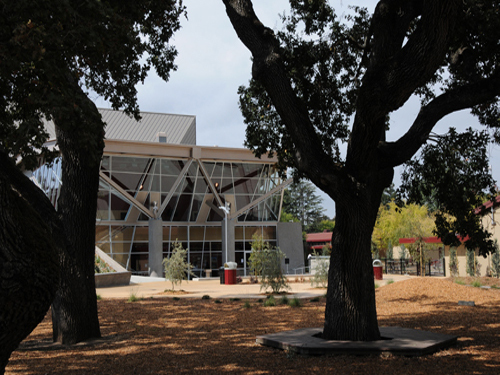 The hall itself is stunningly designed as a spectacular addition to the Menlo-Atherton school. I know of no public or private school concert hall that exists on this level of quality, which is comparable to major performing arts centers around the world. We must commend the extraordinary vision and commitment to excellence on the part of the school board and the design team. 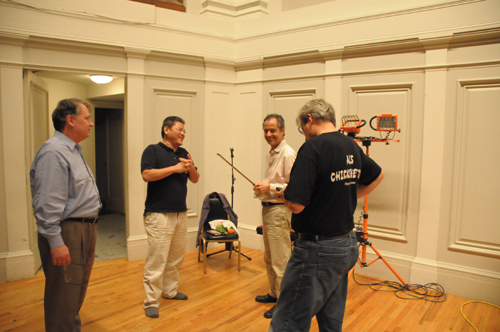 They have given a great gift to the community and especially to lovers of chamber music. The concert was celebrated afterward with a beautiful reception for the artists and festival board members and friends at the home of Patty and Eff Martin, visionary festival supporters, classical music enthusiasts, and our gracious hosts every summer. 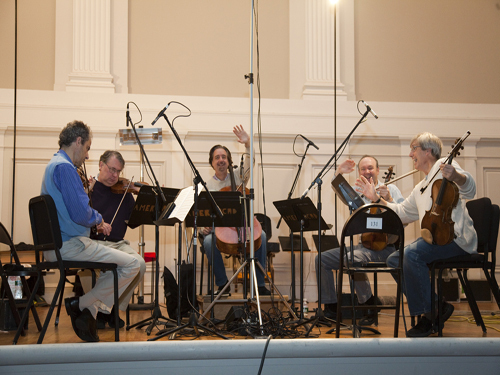 Only movements away from completing its latest recording project for Deutsche Grammophon, the Emerson Quartet met at New York’s Academy of Arts and Letters with violist Paul Neubauer to record Dvorak’s “American” quintet, for string quartet plus viola. 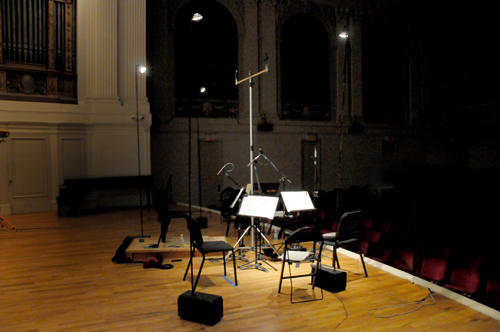 The recording will be included in a forthcoming release of the late quartets of Dvorak in the spring. Violist Paul Neubauer, I’m sure my quartet would agree, is without parallel on his instrument. An adventurous soloist whose repertoire embraces many styles and genres, his contribution to this recording was essential, musically and as a creative and supportive colleague. His many years of experience with this quintet, and his deep affinity for the great romantic traditions of string playing, make it difficult for us to imagine playing the work with anyone else. The Emerson recording team would not be complete without producer Da-Hong Seetoo, whose relentless pursuit of technical perfection, fidelity to the score, quality of sound, and musical taste shine through in every recording we have made together. Returning to the hall where we have made most of our recordings is a tradition that we have been very fortunate to enjoy. Situated on 155th street, between Broadway and Riverside, is the distinguished American Academy of Arts and Letters, which houses one of the most beautiful halls in New York. Used primarily for meetings of the Academy, the hall’s acoustics are ideal for recording, being enclosed in a magnificent stone building and well-removed from the street. The residents of the large cemetery across the street are also very quiet! The darkened Academy hall (house lights make noise) is lit for us by authentic “Finckel Lights” as they are called by the staff at Music@Menlo. They were designed and built by me for the church concerts in Palo Alto, and they are the perfect, practical and economic way to illuminate music and musicians, if I do say so myself. 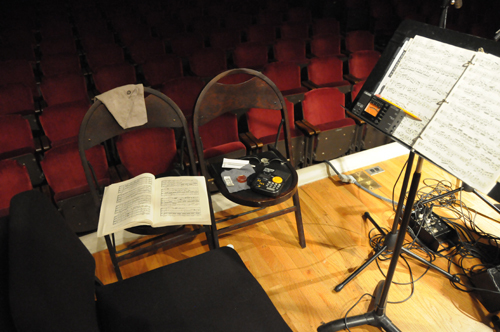 Recording for the Emerson Quartet requires paraphernalia-at-hand: scores, rosin, tuning machines, metronomes, pencils, instrument-cleaning cloths, and sometimes aspirin. Lunch is a ritual that is performed exactly the same way at every session, with Da-Hong ordering Chinese take-out in either Mandarin, Cantonese or Shanghai-nese. The arrival of the food is a much looked-forward-to event, as the inevitable menu of Singapore noodles, egg foo young, sautéed vegetables and diet Cokes relieves the fatigue and prepares us for another grueling afternoon.